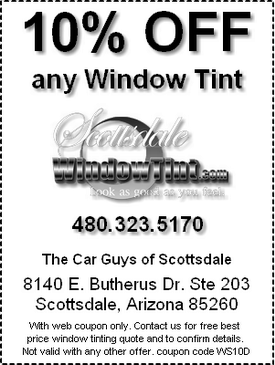 Car, truck, auto window tinting for Phoenix and Mesa, Arizona too! We offer exceptional window tint services to Phoenix and Mesa, Arizona for a competitive rate too. Our goal is to provide you with the highest level of service even after the job is complete to earn your business for life. Our professional installers have over 20 years of window tint experience. Experts in all vehicle makes and models, standard one piece rear windows and micro-edge door windows, we provide these and other services standard while others may charge additionally for them. Protect your Phoenix and Mesa, Arizona vehicle's interior and your skin from harmful UV rays, reduce glare and lower the in-car temperature dramatically. We exclusively use SunTek Carbon XP window film on every install. The carbon series won't interfere with radio, security or GPS signals and is backed by a nationwide manufactures warranty against fading, peeling, bubbling and distorting. Phoenix and Mesa for more information, feel free to contact us by phone or e-mail.